Warning: MOM’S FAMILY wall calendar makes home and life organization significantly easier. 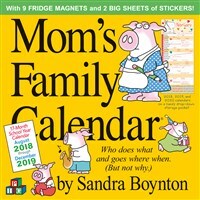 It’s the mother of all family calendars, with a full 17 months of sensible scheduling, practical planning, and, naturally, frolicking dinosaurs to set the mood. Each spread features roomy, vertically arranged grids that have five columns across the top—one for each member of the family—and days of the month along the side. The format makes it easy for Mom and Dad to see what they and the kids are doing, every day. With a roster of happy-go-lucky pigs, musical cows, and Sandra Boynton’s other beloved animals, no wonder it’s our #1 bestselling wall title, with 5.4 million copies sold. It’s also packaged with a magnetized sheet with 9 magnets, 500 full-color stickers, and a handy drop-down storage pocket. Perfect for the kitchen or home, it’s another year of family fun.